Quick analysis: Keep on keeping on. February 2019 showed the new year is, so far, continuing the trends from 2018. FCRA, CFPB complaints are up. TCPA, FDCPA complaints are down. 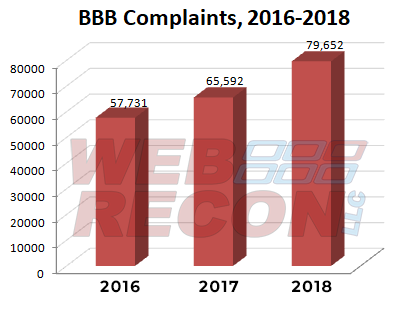 BBB reporting lags too far behind the other categories to make any sense in the grid, but year over year complaints against creditors and debt collectors are growing very aggressively. In other news, putative class actions were pretty typical last month with 21.5% of FDCPA, 30.3% of TCPA and 6.5% of FCRA lawsuits filed that way. And finally, for the second month in a row Delaware FCRA attorney Antranig Garibian represented more consumers than anyone else (49). He holds the crown for most lawsuits of the year as well, with 100 consumers represented. 1011 consumers filed BBB complaints, 3731 consumers filed BCFP complaints, and about 1169 consumers filed lawsuits under consumer statutes from Feb 01, 2019 to Feb 28, 2019. Of those cases, there were about 1169 unique plaintiffs (including multiple plaintiffs in one suit). Of those plaintiffs, about 379, or (32%), had sued under consumer statutes before. About 765 different collection firms and creditors were sued. There were a total of 1011 BBB complaints from Feb 01, 2019 to Feb 28, 2019. That is down -66.4% from last month. There were 3731 complaints filed against debt collectors from Feb 01, 2019 to Feb 28, 2019. This includes 3606 (97%) timely responses to complaints, and 125 (3%) untimely responses.